Families of the Myanmar Tatmadaw and the Royal Thai Armed Forces (Army, Navy and Air) jointly held the ceremony to offer rice and alms to 1,000 members of the Sangha from monasteries in Nay Pyi Taw Council Area on the platform of Uppatasanti Pagoda, here, this morning. 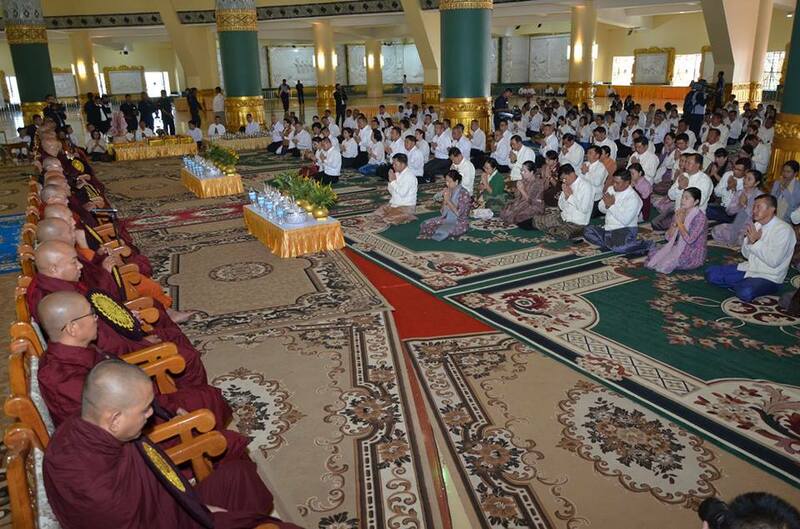 The ceremony was attended by members of the Sangha from monasteries in Nay Pyi Taw Council Area led by State Ovadacariya Presiding Nayaka of Maha Withutayama Zaygon Monastery of Pyinmana in Nay Pyi Taw Abhidhaja Maha Rattha Guru Bhaddanta Kavisara, Commander-in-Chief of Defence Services Senior General Min Aung Hlaing and wife Daw Kyu Kyu Hla, Chief of Defence Force of the Royal Thai Armed Forces Gen. Tarnchaiyan Srisuwan and his spouse Mrs. Jiraporn Srisuwan, Deputy Commander-in-Chief of Defence Services Commander-in-Chief (Army) Vice-Senior General Soe Win and wife Daw Than Than Nwe, and senior military officers of the both countries. 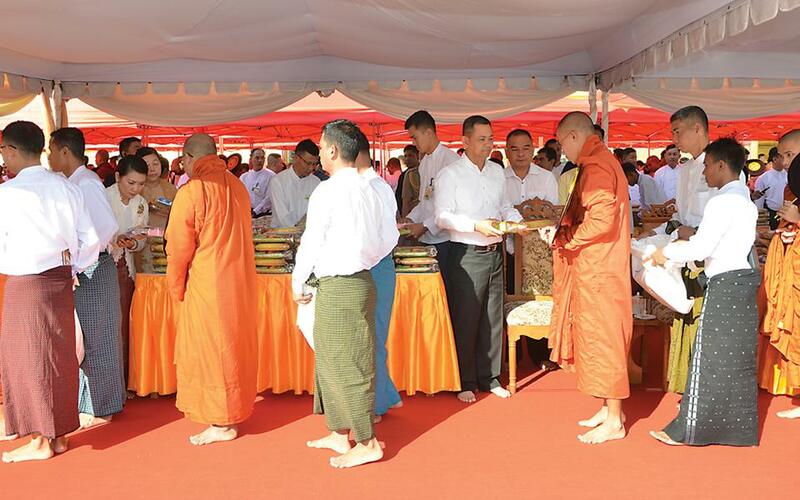 First, the Senior General and wife, the Thai Chief of Defence Force and spouse, and senior military officers from the both countries offered rice and alms to 1,000 members of the Sangha led by State Ovadacariya Presiding Nayaka of Maha Withutayama Zaygon Monastery of Pyinmana in Nay Pyi Taw Abhidhaja Maha Rattha Guru Bhaddanta Kavisara. The Senior General and wife, and the Thai Chief of Defence Force and spouse posed for documentary photo. 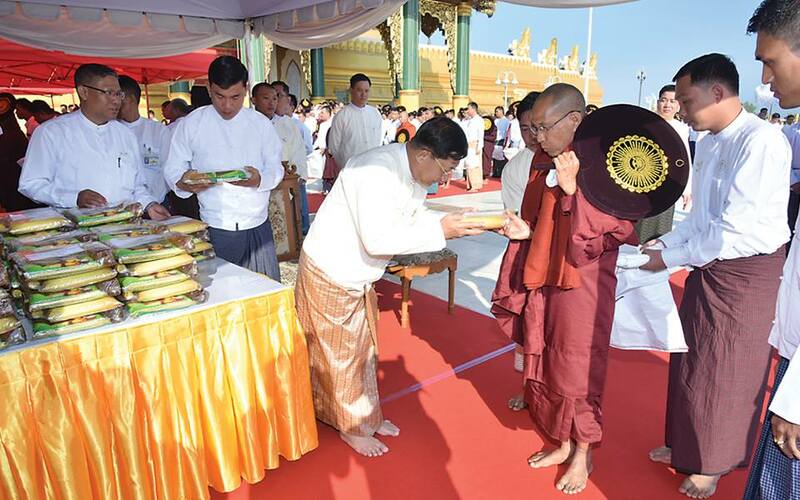 Next, families of the Myanmar Tatmadaw and the Royal Thai Armed Forces marked the successful completion ceremony of offering rice and alms to 1,000 members of the Sangha. 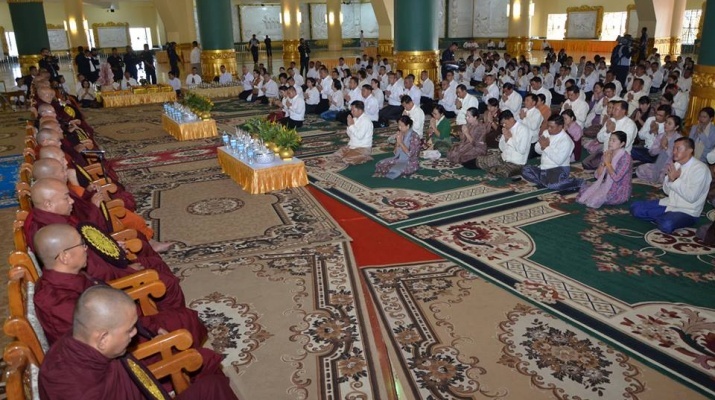 The Senior General and wife, the Thai Chief of Defence Force and spouse together with congregation took the Five Precepts from Sayadaw Bhaddanta Kavisara and Metta Sutta recited by members of the Sangha. The Senior General and wife, the Thai Chief of Defence Force and spouse, the Vice-Senior General and wife and senior military officers from the both countries donated offertories to members of the Sangha. 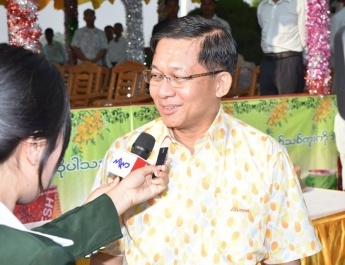 The Senior General and wife donated cash to be spent on offering gold plates and carrying out renovation at Uppatasanti Pagoda and for Maha Parahita Orphanage (Sama Hill). Officials accepted the cash donations and returned certificates of honour. Those present took a sermon delivered by Sayadaw Bhaddanta Kavisara and shared merits gained for all donations. 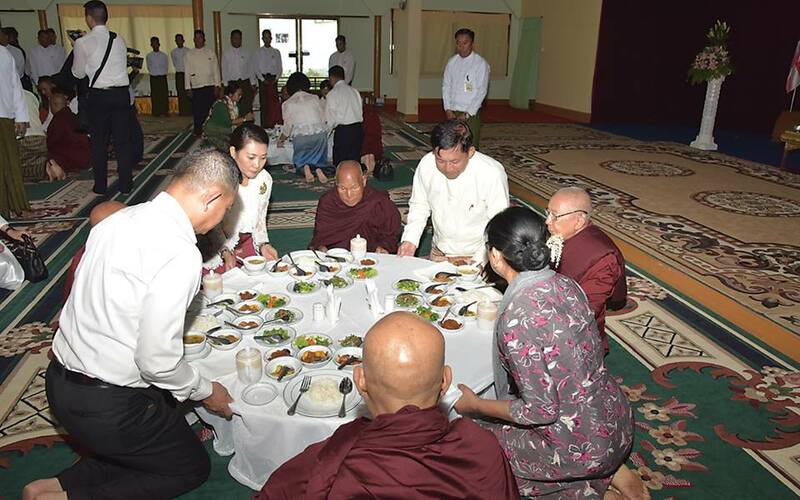 The Senior General and wife, the Thai Chief of Defence Force and spouse, the Vice-Senior General and wife and senior military officers from the both countries offered day meals to members of the Sangha led by Sayadaw Bhaddanta Kavisara. After the ceremony, the Senior General and wife, and the Thai Chief of Defence Force and spouse had documentary photos taken together with senior military officers from the both countries. 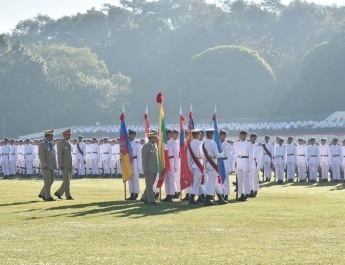 The today’s ceremony, for the first time, aimed to be a milepost of further strengthening friendly relations between the Myanmar Tatmadaw and the Royal Thai Armed Forces. 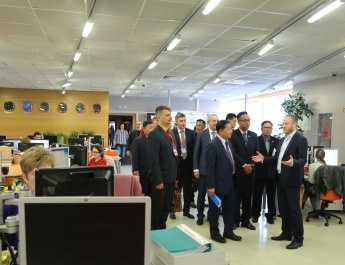 The ceremony was attended by more than 120 members of the goodwill delegation led by the Thai Chief of Defence Force. 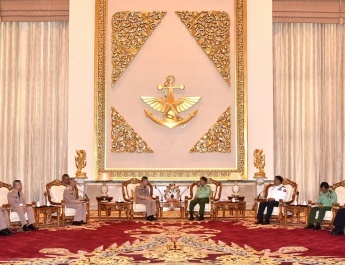 The goodwill delegation of the Royal Thai Armed Forces has plans to pay homage to Maha Muni Buddha Image in Mandalay and visit to Mandalay Hill.